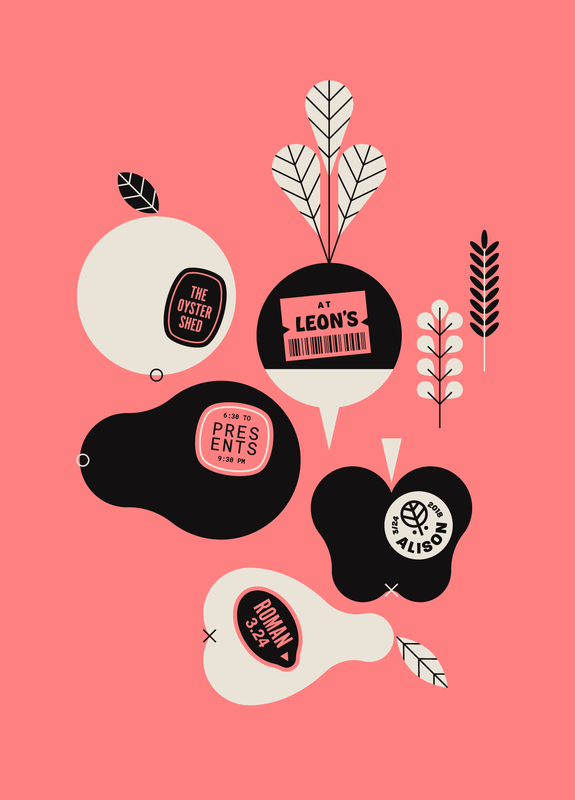 March brought on a lot of fun poster and apparel work for Leon's Oyster Shop. Gabrielle Hamilton of Prune, up for a James Beard againnnn this year, visited the Shed and that event needed a shirt. Kismet, the LA restaurant also up for a 2018 James Beard, came to town and that needed a shirt. And this weekend Alison Roman is in town, author of "Dining In," and her event needed a shirt. Shirts all around and more work coming to the site soon! Click here to view the whole Leon's collection. Many more logos have been added to the logos page! Over the past two years as an LLC'd kid I've been fortunate to come away from many a project with work I'm stoked on. That isn't to say its all been sweet, sweet honey, but for the most part I can say I've had some chill clients. Thanks to all of them for making me last two years in the world of self-employment. Just as Lorenzo de' Medici was patron to greats, Charleston, SC has it's own patron of the arts: Mister Brooks Reitz. I can't put myself on the level of Michelangelo, so this analogy falls short, but Brooks has been nothing but supportive of BS Diseño and he is always looking for new artists to represent his brands. I've had the pleasure of working with him on several Leon's tees, some Jack Rudy collateral and now a Little Jack's piece! Click here for the Leon's collection. Up top are the shirts for Jack Rudy and Little Jack's. LINK: PURCHASE THE RUDY SHIRT! As part of the ongoing Leon's Guest Chef poster series, I drew some letters for the event using a tile pattern found on Bar Bolonat’s site. Then I headed over to Kinko's to hog the oversize printer for some 17 x 22s. Feast was a welcome breath of fresh Air and cookery on the Isle of Palms. Air Casebier opened up shop last year on Carolina Blvd. and Olivia and I danced a happy dance. The two of us have been lucky, lucky, taste-testing cats for Air's catering and menu planning, so we were thrilled to help with some photography and design. Don't let the grayscale fool you, Air's cooking is vibrant and colorful, and her outlook on life is always full of positivity. Below is a little flyer I designed for one of many La Morra dinners she hosted out at 1028. I've been trying to sneak new work in here and there, and there and here, but it is going to take a little time to photograph all of the new work I've been sitting on. For now I've been uploading the files until I can bother Olivia to drag her camera around town. Cris and Bob, of Burnt + Salty, were dream clients and super down to explore a style that was unlike any of their existing brand collateral. We started off with a new look for the chili glaze and with hardly any nudging they let me explore a re-design for the company. We wrapped up the glaze label and jumped back to work on a new logo with the new illustration style in mind. All of the new labels are out and they're printing new merch every other day! Grab a bottle and a hat while I start planning how to photograph the new stuff. Check out the first shirt printed by Grizzly Wheeler!